Frances crowded into the Florida Panhandle on Monday, taking a second swing at a storm-weary state where it already had knocked out power to 6 million people, torn up roofs and boats and been blamed for at least seven deaths. While Panhandle residents rode out the tropical storm's heavy rain and wind blowing at a sustained 65 mph, shutters started coming down in the south and residents began returning to homes they had evacuated. The return revealed fresh hardship as motorists waited for gasoline in queues that stretched up to five miles, and others stood in enormous lines to get water, ice and other basic supplies. "We really hope to get ice and everything else. We don't know what they have in there," said Christine Bland, standing in line with about 1,500 other people at a Wal-Mart in Palm Beach County. Up the coast in Fort Pierce, hundreds of people stood in a line with buckets and ice chests on a sunny, steamy afternoon. The core of the storm, once a powerful Category 4 hurricane before it slowed somewhat, slammed into the state's Atlantic coast early Sunday. After crossing the state and a corner of the Gulf of Mexico, it made its second Florida landfall at St. Marks, 20 miles south of Tallahassee, early Monday afternoon. At 8 p.m. EDT, maximum sustained winds had dropped to near 40 mph. Forecasters said Frances could bring up to 10 inches of rain and a 5- to 10-foot storm surge to the Panhandle. Four coastal counties ordered evacuations. Linda Sellars worried about her property as she and her husband retreated inland from their home on a spit of land that sticks into the gulf near Panacea. "I worked the last three weeks in the yard," she said. "I'm going to be really upset if it blows my yard away." For some who had returned to their property, the discovery was one of devastation. 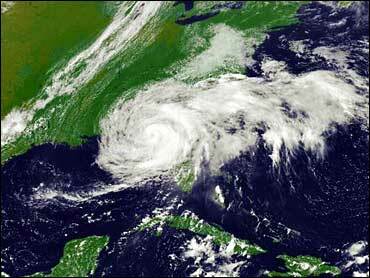 "When I look around, 95 percent is gone," hurricane victim Rita Johnson told CBS News Correspondent Mark Strassman. "I'm not the only one. I'm not just thinking of me, I'm thinking of everyone else too. It's not fair to say, 'Why me?' The answer to that is, 'Why not?'" The storm's wind and low pressure had sucked water out to sea away from the Big Bend, Florida's elbow where the peninsula joins the Panhandle. "There was no water on the gulf along the Taylor County coastline as far as you could see," county emergency management director Roy Woods said. Later Monday night Frances was expected to douse Alabama and Georgia, then the Carolinas. By the end of the week her rains could affect areas as far north as the Great Lakes, reports CBS News Correspondent Lee Cowan. "You can tell it's getting very close — there's lots of rain, lots of wind now," said Penny Bolin, executive director of the Red Cross chapter in Albany, Georgia "What we're concerned most about is flooding — we're expecting large amounts of rainfall." But while Frances was heading out of Florida, residents had started keeping a wary eye on yet another storm. Ivan, the fifth hurricane of the year, had sustained wind of near 105 mph and was centered 305 miles east-southeast of Barbados in the central Atlantic. At a Florida Turnpike rest stop in West Palm Beach — one of the few places in the area with gas and power — a 5-mile line of motorists waited for fuel. "It took a little while, but I'm glad to be here," said Greg McCourt, who waited an hour to get gas for a trip to Georgia. Airports in Tampa, Orlando, West Palm Beach and Key West reopened. As of midday, more than 73,000 people remained in shelters, down from about 108,000 on Sunday. The largest evacuation in state history had affected 47 of Florida's 67 counties. Cruise ships arrived belatedly at the Port of Miami after staying at sea to avoid the storm and extending their passengers' voyages. The Postal Service played catchup by delivering mail on Labor Day. Some schools made preparation for classes after serving as shelters during the weekend. The Federal Emergency Management Agency was prepared to distribute 1.5 million gallons of water and 1 million meals. President Bush on Wednesday will travel to Florida — a state essential to his re-election bid — to survey the damage inflicted by Frances, reports CBS News White House Correspondent Mark Knoller. One risk-assessment company estimated insured losses from Frances could range from $2 billion to $10 billion. A state official said damage could have been worse. "If it's the same all the way across, we're looking at a couple of billion dollars rather than the big numbers we were seeing earlier," state Chief Financial Officer Tom Gallagher said. There were at least 25 arrests for looting statewide. Frances' storm's core angled across Florida to enter the gulf north of Tampa, its path crossing some of the area hit by Charley, which killed 27 people in Florida and caused an estimated $7.4 billion in insured damage. The seven Florida deaths blamed on Frances included a grandson and a former son-in-law of Florida State University football coach Bobby Bowden. The pair died in a collision on a rain-slippery highway. On Monday, a school employee died in Ocala after falling from a ladder while checking the roof of a middle school for damage. A man in the Fort Myers area died Sunday while walking his dog when he was struck by flying debris. A Gainsville woman was killed in her living room when an oak tree crashed onto her mobile home. Two other people died in traffic crashes blamed on the storm. There were two earlier deaths in the Bahamas, where Frances forced thousands from their homes.